Knoco stories: What do KM professionals actually do? What do KM professionals actually do? 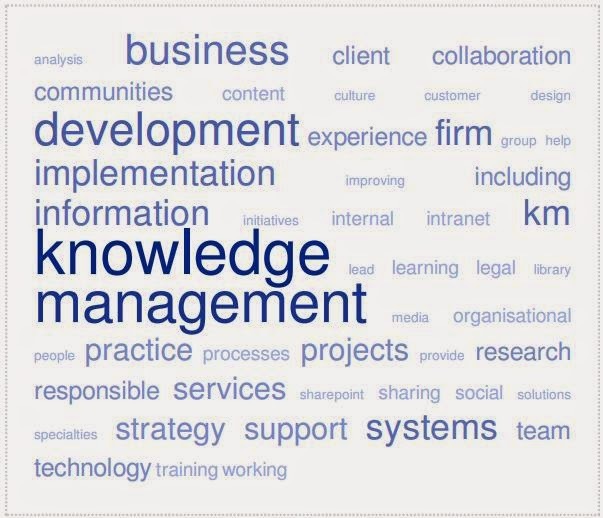 The Word Cloud shown below is derived from linked-in job descriptions of 40 people with "knowledge Management in their job title, as an attempt to analyse the way KMers describe their job. It's an interesting plot, but becomes even more interesting when we contrast those KMers from legal firms, with those who aren't. First, the main cloud, shown above. 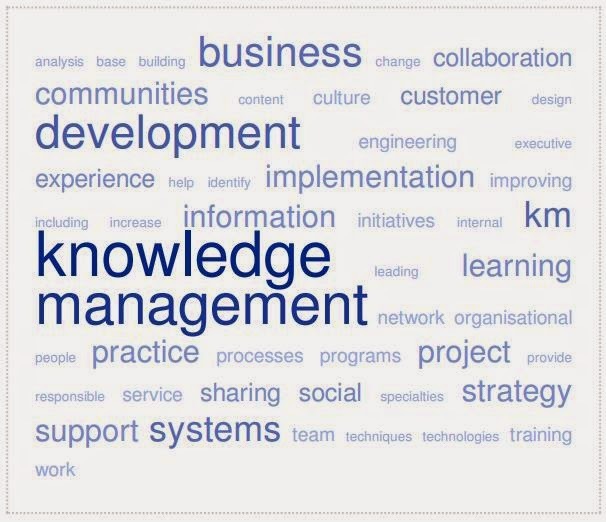 I created this by choosing at random 40 of my linked-in connections who had "knowledge management" in their job title, and who gave a detailed description of their main tasks or activities. 20 of these people were from legal firms, 20 were not. All were from the UK and US. I copied their current job description, and pasted the aggregated text into tagcrowd.com. The words which are displayed in the plot above are those which were most commonly used (excluding prepositions etc), and the size of the word is proportional to the number of times it appeared. Obviously, knowledge is at the heart of the job, and management as well. Practice/processes and technology appear - so two of the 4 table-legs of KM are present. As we know, governance and roles are frequently ignored. It's good to see Collaboration and Communities in there, also learning and experience. Now let's compare clouds for the people who work in legal KM, and those who don't. There are a number of words that appear in the legal word cloud but not in the non-legal cloud. There are still a lot of words that appear in both clouds, but you can see two distinct flavours of KM here. 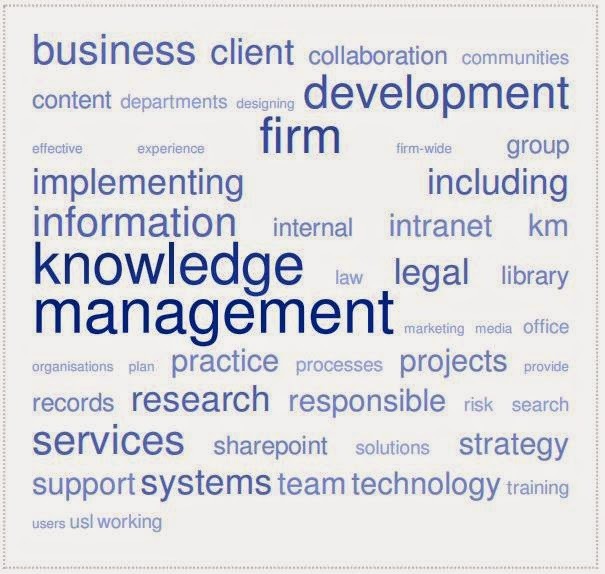 Legal KM has a greater focus on records management, use of SharePoint, library techniques, and research (the word Content is also much bigger in the legal cloud). Non-legal KM has a greater focus on continuously improving, on organisational learning from experience, and from networking people into social communities (the word Communities is also bigger in the non-legal cloud). The legal KM flavour is largely driven by the nature of the legal business, and the focus on specialist product, but there is still room for some of the non-legal KM components to begin to be developed in the legal sphere as well.